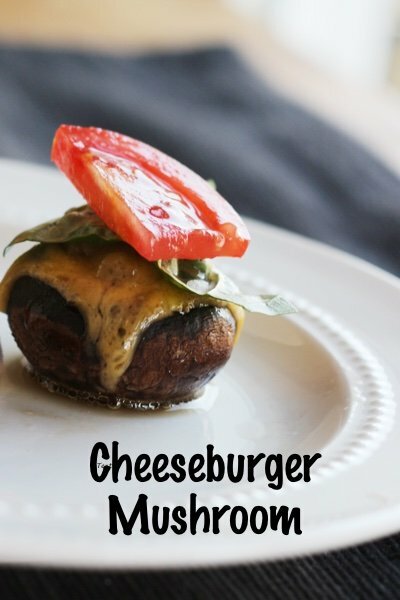 If you are looking to eat a cheeseburger but don’t actually want to eat one try this good stuffed mushroom recipe. 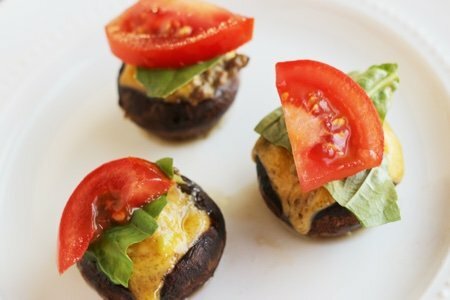 I love stuffing mushrooms because you get a perfect portion size bite that looks pretty cute. Also, for those low carb people out there, mushrooms are a healthy substitute for bread. Many of the stuffed mushrooms recipes are decadent. Chefs use cheese, sausage, cheese and sausage and ruin the whole health benefit of the mushroom. Of course, I get cheesy stuffed mushrooms would be divine but ALAS this is Snack Girl and you can find perfectly brilliant stuffed mushrooms on other websites. Until then, give these a try! They are super tasty and will hit your cheeseburger craving right in the face. Also, give these roasted parmesan mushrooms and mushroom cap burger a try. Don’t be afraid of mushrooms because of the dirt. I learned a new method of washing them that makes it go fast. Simply fill a bowl with cold water, dunk the mushrooms, and swish them around until the dirt falls off. Place them on paper towels and dry them and you are good to go. I used to wipe them individually and I have found that isn’t necessary. The best part of this recipe is that you don’t have to precook the filling. Simply mix it up, shove it in the mushroom, and bake. Buying a ¼ pound of beef is next to impossible unless you have a butcher. I bought a pound and then froze the rest for another recipe. These would be a wonderful game day snack or nice snack for a casual New Year’s party. What do you stuff in mushrooms? Heat oven to 350 F. Wash the mushrooms in a large bowl of water, dunking them until the dirt is off. Dry with paper towels. Remove mushroom stems and chop half of them (discard the other half or save for another purpose). Mix in a medium bowl with beef, avocado, Worcestershire sauce, black pepper, and cayenne. Place mushroom caps on a rimmed baking sheet. Place beef mixture in each cap and top with a small slice of cheddar cheese. Bake for 20 minutes. Top with tomato slice and basil leaf and serve immediately. These look tasty Lisa, do you scrape out the gills in the mushrooms before stuffing them? Thanks and Happy New Year. Lisa another one of your GREAT Ideas.....I love it... I am actually going to make these to bring to my daughters tomorrow for New Years Day dinner. keep coming up with wonderful SMART IDEAS..
Wishing you and your family a very healthy and Happy new Year..
@Phyllis - you can leave the gills. Thanks for your question! These look cute and easy! Even a little piece of onion would be nice on top of the cheese with a dab of ketchup after they bake [if you don't have fresh basil or tomato]. I personally must have onion with my burger, preferably raw! What is the purpose of the avocado? @kay - the avocado is optional - just makes it taste good! Thanks for your question. What can I replace the ground beef with? @vincent - you could use Quora crumbles or quinoa. It would change it quite a bit but it would still be good! Thanks for your question.